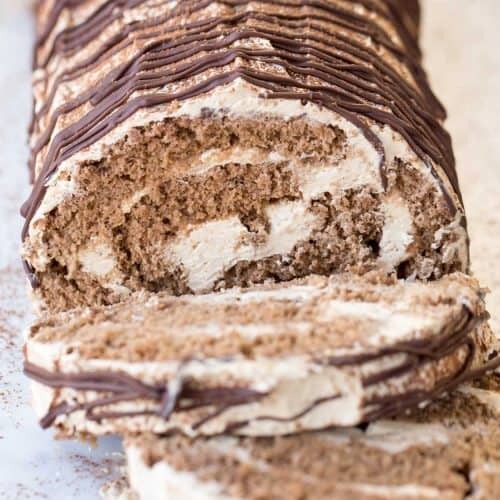 Mouthwatering delicious Coffee Roulade recipe. 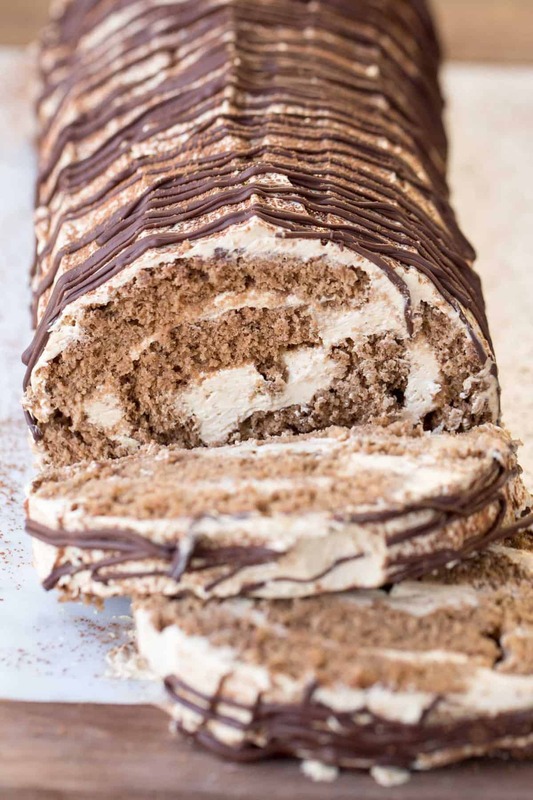 Soft and airy chocolate cake roulade with rich coffee cream. This dessert is for the coffee lovers! If you like coffee flavored dessert like this one, also try our Layered Coffee Cake! 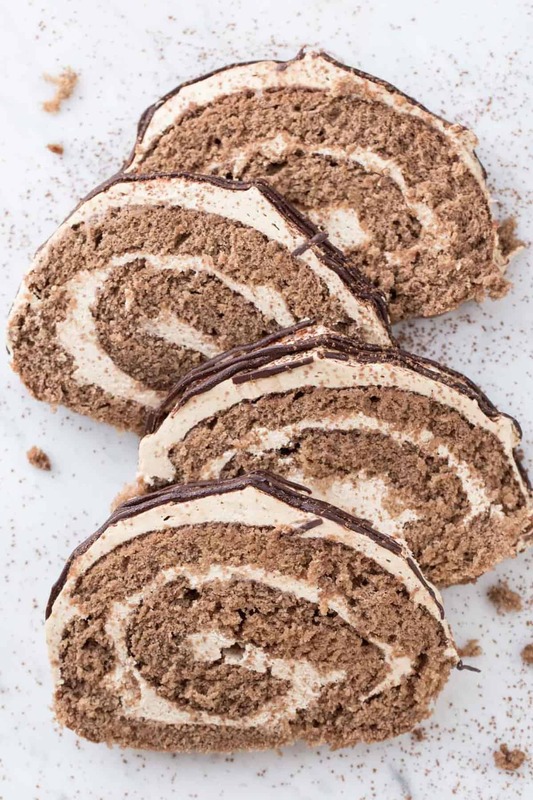 This coffee roulade will become a family favorite. The chocolate cake roll is airy and sponge-like and so soft. The cake is generously loaded with a coffee cream that adds so much richness and enhances the flavors of the overall dessert. If you enjoy coffee, this dessert will be on repeat in your home. Prepare the chocolate cake roulade. Once the cake is cooled, soak with orange juice. 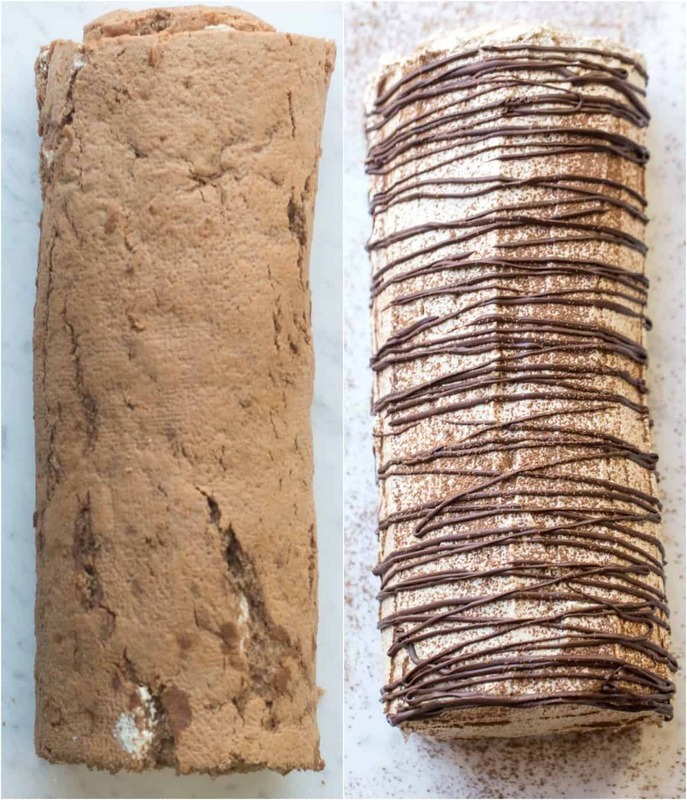 Tightly roll cake into a log. Spread remaining cream over top and sides of the roulade. can I prepare the cake roulade in advance? Yes, this coffee roll can be prepared a day in advance. Keep covered and refrigerated. can I substitute the soaking? The orange juice may be substituted for cold coffee. what size pan do I bake cake roulade in? You’ll need a large rimmed baking sheet, approximately 17″x11″ to 18″x12″ in size. You can also use (2) 9″x13″ baking pans. In a large bowl, add eggs and sugar. Beat on high speed for 10-12 minutes or until the mixture has tripled in size. Add cream cheese and powdered sugar to a bowl. In a small measuring cup add the instant coffee and pour the hot water over it. Combine coffee and hot water, mix vigorously until coffee dissolves. Add the cool whip and mix. Refrigerate cream until ready to use. Unroll the cake and brush with orange juice. Roll the cakes back up into a roulade. Cover tops and sides of both cakes with the remaining cream. Dust roll with cocoa, optional. Thanks for visiting our online home. Do stop by and visit again. 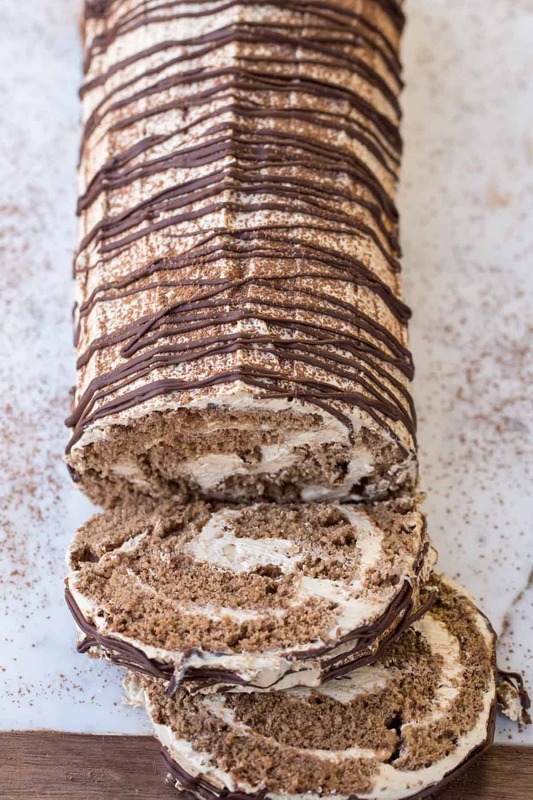 Valentina, this coffee roulade looks so good and easy to prepare. Being form Seattle, we love everything with coffee so this is definitely my type of treat! Cake came out sooo sooo yummy with strawberries!!!!??? Thank You for Recipe Valentina! Valentina, I’m making a Cake instead of Roulade. What do you think if I add strawberries or raspberries between each layer? orange juice, coffee & fruit? Honestly, I’ve never tried any fruit so cannot be for sure?. You cannot taste the orange juice at all so perhaps that’ll work. Sorry, not sure what to say without trying that.. Happy baking though..?? Do I need to change any ingredients for Testo? Hi Diana. You’re so sweet! This is one of my favorite desserts too:-). Yes, you definitely can make it into a round 9″ cake with same ingredients. It’s on my to-do list to post actually!:). You know what I like to do? I like to crush hazelnut wafers (or trubochki) and use that for decor. Tastes likes hazelnut coffee cake;)..
is orange juice necessary to this recipe? I have a bunch of kampot and I would like to know if that works. Just finished making this. I made it into one big roulade. Looks beautiful. Can’t wait to try it! Hello Smiley:).. Your version sounds perfect, hmmm. You can never have too much cream right?;).. Thanks for the feedback..
Hey what size pans can I use for this rylet?